It has been a few months since I organized a bug-themed birthday party for our six year -old. At the party, he and his friends drew pictured on blank quilt blocks, and I’m finally getting around to finishing the quilt. This was a very simple quilt but one with a lot of meaning. My friend Ari’s mother is a talented quilter, and Ari and I had helped her make quilts for the school auction, first with our older kids’ class and more recently with our younger ones. Through some type of temporary school spirit insanity, hubby ended up purchasing the first quilt, but our wallets were not up buying another quilt this year, and I wanted to find a way to make it up to our second boy. As I am sure all of you with multiple children know, our love for each of them is unique, but it does seem that the second – and in this case also middle – child tends to feel a need to fight for your attention and love. This instinct can make our dear boy act out some times, and I’m always looking for ways to remind him that he is special. This quilt was a part of that effort as well. Before the party, I cut 7.5″x7.5″ squares of white pre-washed cotton and taped them on to cardboard for stability. I cut more than enough for the guests, and it is a good thing, because many of the kids wanted to draw more than one picture, including the birthday boy himself, who drew three! I also set out fabric markers. I like these Marvy Uchida Fabric Markers that come in many beautiful colors. 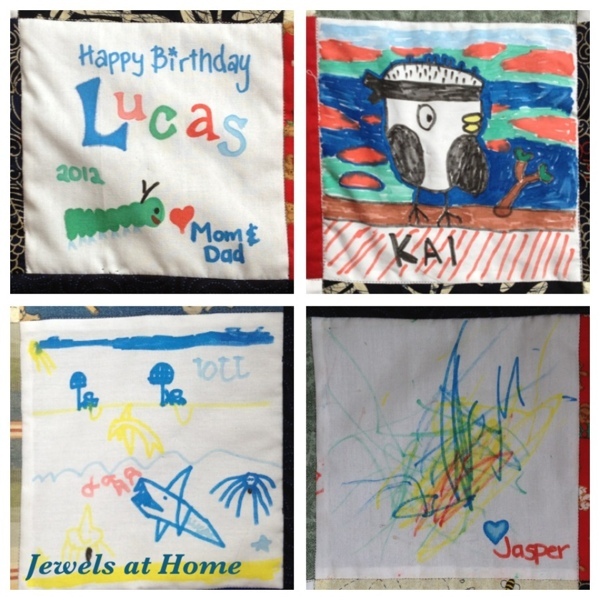 Decorate-a-quilt-block is a great activity for a birthday or baby shower. Here is how some of the quilt blocks turned out. Each one is different and expresses the artist’s personality, but they work together. Incorporate drawings into a memory quilt. And here is the finished quilt! As I mentioned, this is a simple quilt. I found fabrics that had animals and other prints in a range of primary colors and mixed them randomly with the drawings (and I should add that mixing “randomly” actually took ages, because I wanted to balance out the colors through the quilt). Quilt incorporating blocks drawn at a birthday party. By the way, here is how the amazing inspiration for this project looked. Ari’s mom designed the pattern, and each child in the class painted a leaf. It’s hanging in our older boys’ room, and I love looking at it every day. 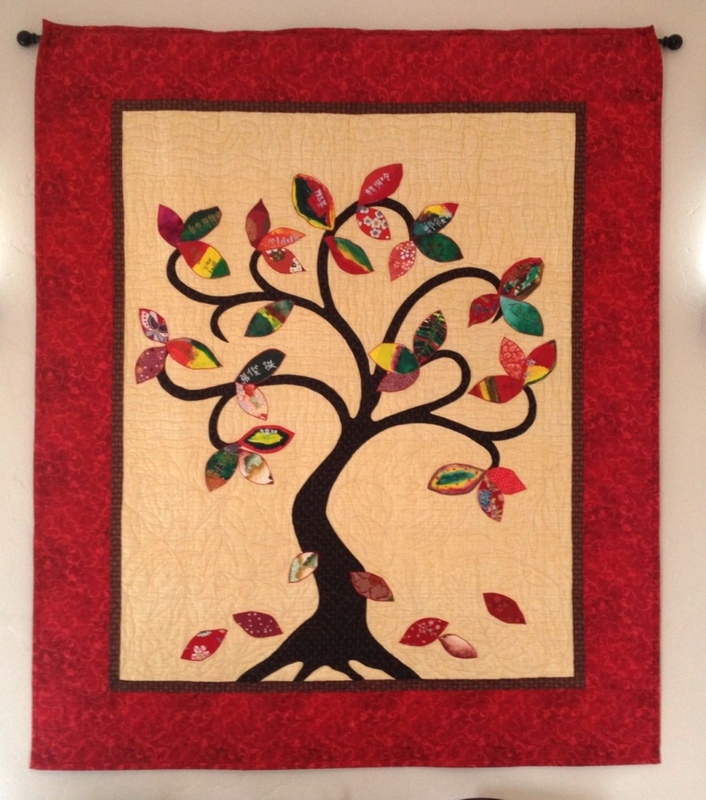 “Family Tree” quilt for a classroom art project. Though far, far more humble from an artistic perspective, I think this smile says that the new quilt’s recipient appreciates his special keepsake. Quilt made with blocks drawn at a birthday party. 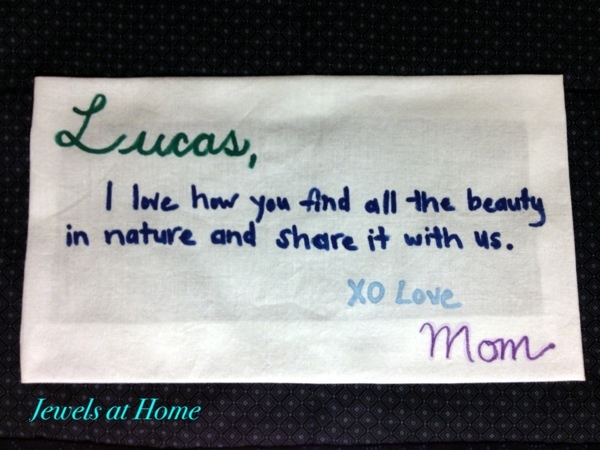 To finish the quilt, I sewed a label on the back with a special message for Lucas. 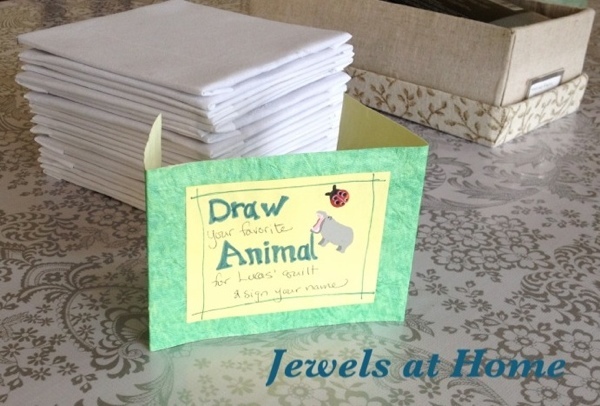 You could also have party guests all sign a fabric quilt label. 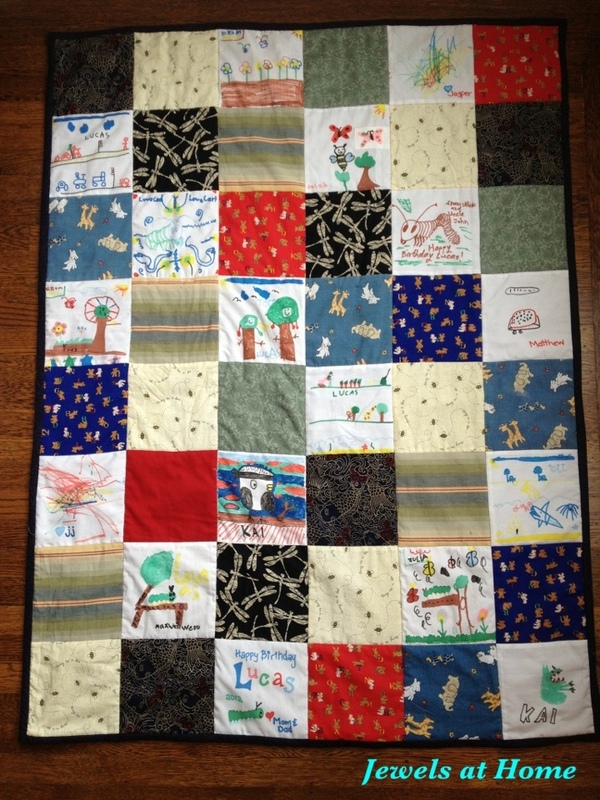 That’s what we did with the class quilt for Lucas’ class – each child signed the back. And I know first-hand how special it is to have the story of a quilt sewn on the back. Below is a quilt that is hanging in my craft studio. 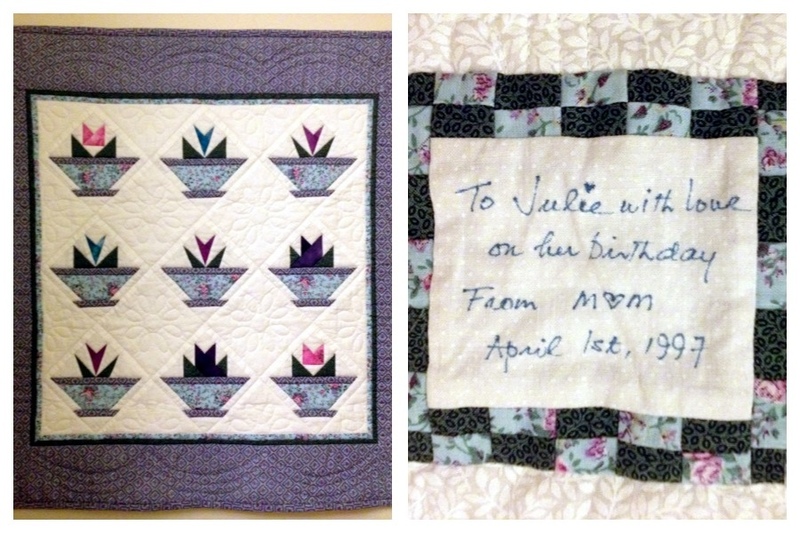 My mom made it for my birthday, and while she made many beautiful quilts, this one has particular meaning, because she made it when she was sick from chemotherapy. A label on the back of a quilt helps tell its story. A special quilt with its story on the back. From Jewels at Home. So, finishing this quilt definitely overdue, but hopefully, it was worth the wait, and I hope our little guy can feel how much he is loved, when he curls up under it. This is so fabulous! 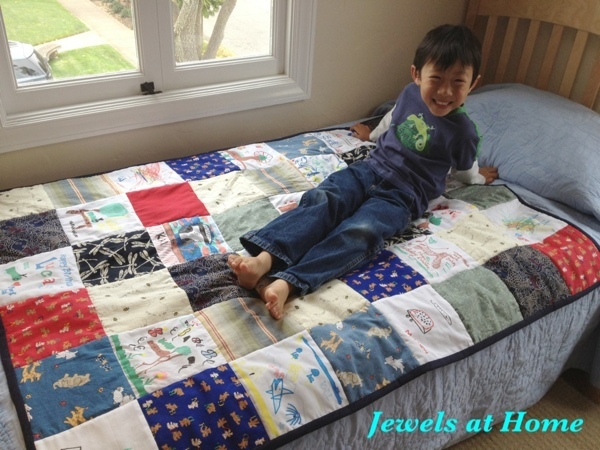 I love your quilt — what a terrific idea! Honestly — it’s just great. I’ve taken 3 sets of sewing courses but have not tried my hand at quilting yet. I would love to do something like this for Charlotte’s next birthday. I’m going to look up quilting courses. Thanks so much, Janice! It’s a very simple quilt – I am sure you can learn to do it pretty easily, after the sewing courses.